J. Bot. 12: 365 (1874). J. S. African Bot. 36: 247 (1970). Origin and Habitat: South Africa. Orange Free State. Habitat and ecology: Scilla saturata forms “large colonies in marshes and marshy grassland, up to c. 1980 m.”  “Plants tend to grow in clusters in shady, damp grasslands” . 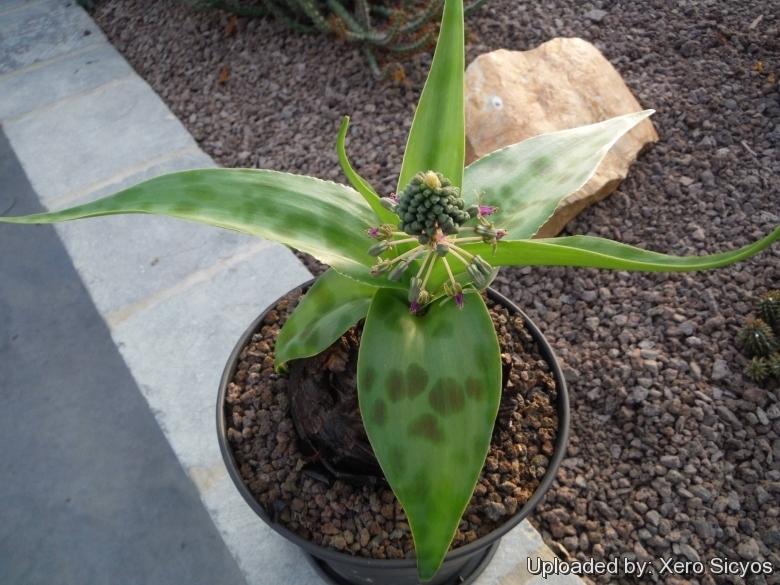 Description: Scilla saturata, is one of the morphological or geografical forms of Ledebouria cooperi which is a widespread and morphologically variable taxon. Ledebouria is only a very recently formed genus. Previously, most of the plants belonging to this genus were classified as Scilla species. Scilla saturata consists of a very small bulb with a long slender leaf. The leaves that are visible above the ground look much like coarse grass while the bulbs, at their biggest, are only about 1-2 cm in diameter. The flowers colour is given as varying between deep mauve and light purple-rose or entirely green and they protrude from a short stem   . Bulb: Ovoid to subglobose, with dark, papery scales, or not well developed, 12-18 mm in diameter. It is of interest that a method of vegetative reproduction is provided by the shoots which arise from the axils of the lower bulb-scales . Leaves: 1-5, linear, lanceolate, more or less acuminate, oblong or ovate, (3-)10-20(-25) cm long, (1-)6-8(-20)mm broad at the middle, narrowed gradually to a clasping petiole 2.5-5 cm long, upper surface rather uniformly green, lower surface green with longitudinal purple striations, and with purple spots toward the base. Inflorescence: Peduncle slender, 7-15 cm long, more or less erect; raceme dense, oblong, 2.5-4(-5) cm long, 18-25 mm in diameter, with up to about 50 flowers. Central pedicels 4-8 mm long, lower flowers cernuous (dropping). Flowers: Perianth campanulate, segments bright pink to mauve-purple inside and out, less frequently pink with a green keel, or entirely green,3-4 mm long; stamens nearly as long as the perianth. Filaments linear, bright purple, anthers yellow.ovary globose, stipitate  . 6) Pooley, E. 2003. “Mountain flowers: a field guide to the flora of the Drakensberg and Lesotho.” Natal Flora Publications Trust, Durban. Cultivation and Propagation: Scilla saturata “apparently favours damp places” and “do respond to regular watering although they are resistant to quite prolonged periods of drought”  .